The multidisciplinary approach taken in this program produces skilled professionals who are able to tackle the biggest problems plaguing our environment using a holistic approach. Habitat loss, global climate change, water and air pollution, ozone depletion, species invasions, loss of biodiversity, and the accumulation of toxic wastes are among the many environmental dilemmas our society faces each day. These complex problems pit environmental limits against economic development, diverse cultures, ethics, values, and social stability, and therefore require an understanding of science, policy, society, history, and economics in order to address problems realistically and effectively. Environmental scientists must use integrated and holistic approaches to understand and find sustainable solutions to these problems. Graduates of the environmental science masters are well prepared for a variety of environmentally sustainable careers including consulting, research, policy, and outreach, or further graduate work in a doctoral program. Built on the concept that environmental issues are inherently interdisciplinary, the MS degree in environmental science is offered in collaboration with the College of Liberal Arts. The program's curriculum provides students with a deep understanding of the science behind our environmental problems, the complex set of circumstances that impact environmental issues, and how environmental decisions and policies must attempt to find a balance between environmental conservation, human well-being, and economic development. Students augment their hands-on classroom work with in-depth experiential learning through an individual thesis or project that provides students with the chance to work on real-world environmental problems under the guidance of skilled environmental scientists. The program includes a core curriculum and electives chosen to reflect the student’s background and career goals. A minimum of 34 semester credit hours beyond the bachelor’s degree is required. All students must propose, conduct, and report on an original research thesis or project. This course helps graduate students learn how to assess journal articles, government reports, whitepapers, and essays as well as other relevant sources of information. Students will also refine their discussion and presentation skills and gain experience in effective communication to a diverse audience. This course will introduce students to careers in environmental science, to graduate studies in environmental science at RIT, and to the process of defining, conducting, presenting, and defending a thesis proposal. This course is an introduction to the probabilistic models and statistical techniques used in the analysis of biological and medical data. Topics include univariate and multivariate summary techniques, one and two sample parametric and nonparametric inference, censoring, one and two way analysis of variance, and multiple and logistic regression analysis. This course will build on previous chemistry courses to expand knowledge of biogeochemical cycles, environmental toxicology and applied methods of environmental analysis. The course will be conducted in a workshop format at the graduate level. This course focuses on the application of ecological principles to conservation issues. Human impact on species diversity will be emphasized as it relates to agricultural, forest, coastal and wetland ecosystems. Case studies of management practices used to manage and restore disturbed ecosystems will be included. Students will explore a topic in depth through writing a review paper of published literature. 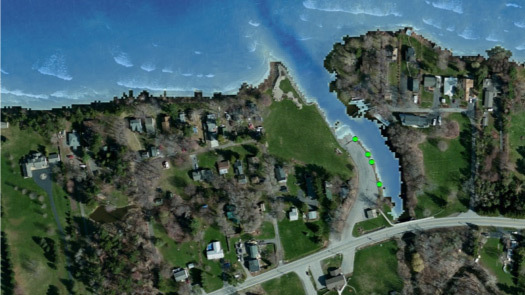 Aerial photography, satellite imagery, Global Positioning Systems (GPS), and Geographic Information Systems (GIS) are extremely useful tools in hydrologic modeling and environmental applications such as rainfall runoff modeling, pollution loading, landscape change analyses, and terrain modeling. This course will: 1) introduce students to spatial analysis theories, techniques and issues associated with hydrologic and environmental applications; 2) provide hands-on training in the use of these spatial tools and models while addressing a real problem; 3) provide experience linking GIS and model results to field assessments and monitoring activities; 4) enable students to solve a variety of spatial and temporal hydrologic and environmental problems; and 5) provide tools useful for addressing environmental problems related to the graduate thesis or project. The thesis option will be available to environmental science graduate students only with prior written approval of program faculty. Students will submit a proposal to a faculty member who agrees to serve as the student's thesis committee chair. The proposal will describe the basic research question to be investigated and the experimental protocols to be employed. Proposals will be reviewed by the program faculty who will give permission to register for thesis credit. This course may be taken several times over the course of a student's graduate program, for variable credits. A written thesis and oral defense are required at the completion of the thesis research. Hold a baccalaureate degree (or equivalent) from an accredited university or college in environmental science, biological science, or a related discipline. Have a minimum cumulative GPA of 3.0 (or equivalent) overall and in math/science. Applicants with undergraduate degrees from foreign colleges and universities are required to submit GRE scores. Submit a personal statement of educational objectives outlining the applicant’s research/project interests, career goals, and suitability to the program. Submit three letters of recommendation from academic or professional sources. International applicants whose native language is not English must submit scores from the TOEFL, IELTS, or PTE. A minimum TOEFL score of 79 (internet-based) is required. A minimum IELTS score of 6.5 is required. The English language test score requirement is waived for native speakers of English or for those submitting transcripts from degrees earned at American institutions. Students are strongly encouraged to contact program faculty before applying to discuss thesis topics and research projects. Students are matched with a potential thesis adviser at the time of admission. The program provides a wide range of research opportunities. Many faculty members are engaged in field-based projects and the college boasts excellent laboratory facilities that support field research, including wet laboratories and computer facilities (traditional and geographic information systems). For a list of past and present projects, and faculty research interests, please visit the program website. Monitoring, mapping, and field equipment: ArcGIS and IDRISI GIS software, ENVS and ERDAS Remote Sensing software, Garmin and Trimble GPS receivers, soil sampling and analysis equipment, water sampling devices, multisonde water quality probes and dissolved oxygen meters, SCT meter, ponar dredges, Li-Cor light meter, plankton samplers, macroinvertebrate nets/samplers, and a library of field reference texts. Other equipment: Fluorimeter, Raman Spectrometer, UV-Vis-IR, GC-MS, ICP, atomic absorption, polarimeter, centrifuge, electrochemical equipment, gas chromatographs, HPLC, viscometer, ESR (built in-house), confocal microscope, infrared carbon dioxide analyzer, Unisense microelectrode system, Lachat autoanalyzer, incubators, capillary electrophoresis, DSCs, DMA, NMR, drying oven, Wiley mill.